Flush fluid for wash out of used and degraded fluid from moderately sludged or viscous systems. Highly compatible with petroleum based fluids. Non-hazardous and non-toxic. Economic for full system flush. Production can be run for a week or more before draining. 1) Remove the used heat transfer fluid from the system. 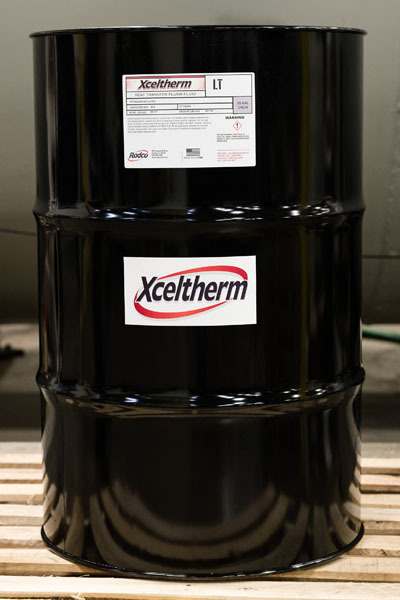 Radco offers a 100 SUS oil (XCELTHERM® LT – Click for SDS) that is additive-free and has a high aromatic content for “hot oil” systems or an aromatic solvent (XCELTHERM® FF) for synthetic fluid systems. The higher the aromatic content the better since it is the aromatic component of the oil that has a solvent effect on system sludge and other degradation products. 1) Drain system including any obvious low points such as the bottom of jackets, etc. 2) Break the lines at the pump intake and discharge. Air blow the system to remove any “heel”. 3) Charge the system with flushing fluid and circulate at approximately 400 F° for approximately 8 hours. If system design permits, the flushing fluid should be run through the expansion tank for approximately two hours of this eight-hour period. The volume of flushing fluid should be sufficient to insure that the pump does not cavitate on start-up. Although this volume is ultimately determined by system configuration, a good rule of thumb is that the flushing fluid volume should be approximately 80 % of the system fluid volume. 4) Again drain system including any obvious low points. 5) Again break the lines at the pump and air blow. 6) Charge XCELTHERM® fluid, preferably from a system low point to avoid airlocks, and follow start-up procedures. Objective: Vent any moisture which may have condensed in the system and any residual light ends remaining from a system flush. In this procedure the fluid should be run through the expansion tank if possible, as the lights will be vented more quickly. In any event, a watch should be maintained on the expansion tank vent or the system pressure gauge. It is not unusual to see puffs of vapor from this vent or an increase in system pressure as the fluid is heated and the lights escape. However, if an increase in the rate of vapor generation is observed, the temperature should be maintained or even slightly reduced until the rate of venting lessens. Only then should the temperature be increased. 1) At a temperature rate increase not to exceed 1°F (½°C) per minute bring the system temperature to 200°F (93°C) and circulate for approximately the length of time necessary for the heat transfer fluid (HTF) to cycle once through the system. For example, if the pump output is 180 gallons/minute (680 Liters/minute) and the system fluid volume is 1800 gallons (6800 Liters), the HTF cycle time is 10 minutes. 2) At the above temperature rate bring the system to 230°F (110°C) and circulate for 1 HTF cycle while observing the expansion tank vent/pressure gauge. 3) At the above temperature rate bring the system to 260°F (127°C) and circulate for 1 HTF cycle while observing the expansion tank vent/pressure gauge. 4) At the above temperature rate bring the system to 300°F (149°C) and circulate for 1 HTF cycle while observing the expansion tank/pressure gauge. At this point, if everything is running satisfactorily and you have been running through the tank, the expansion tank may be bypassed and the system put in its normal fluid flow configuration. 5) The system temperature may now be raised to operating temperature in 50°F (25°C) increments with each incremental rise followed by an HTF cycle time observation period.